I was not initially impressed by this episode. Don’t get me wrong—it was quite strong, and I still enjoy learning about Over There, about the Fringe Division, about the relationships between Faux/Olivia, Alterna-Francis, and Lincoln Lee. But at first blush this felt like a stand-alone, and Fringe can be so much better than that when it wants to be. So I let it simmer for a while, and then I realized that this isn’t a stand-alone at all: it is a compelling thematic and psychological step in the progression towards…whatever it is we’re progressing towards. Olivia and Ethan Hawke’s Asymmetrical Twin (aka Milo) are both subjects of neural intrusion: Olivia has the memories, but not the instincts, of Fauxlivia, and Milo was Flowers-for-Algernoned into inhuman savantism. And Milo’s predictive capabilities, in turn, parallel Walternate’s vision for what will happen as Olivia becomes fully Faux. Milo’s ability to predict a long chain of causative elements was flawed in two ways. He was unable to predict the impossible—the fact of an otherworldly instinct (or lack thereof) intruding into his ultimately highly ordered view of the universe. Olivia has all the memories of Fauxlivia, but she hasn’t put them into practice yet: it’s sort of like she’s memorized the handbook on how to ride a bike, but hasn’t even tried out a tricycle yet. Milo’s ability to fully understand Olivia’s actions was dependent on the rules of his universe, which is not yet fully hers. Walternate, in turn, is hoping/predicting that Olivia will permit herself to be experimented on. But how accurate can that prediction be, when Olivia has the knowledge, but not the experience, of life as Fauxlivia? Both Walternate and Milo attempt to take the God’s eye view of the world, but they’re not Observers. (And even Observers can be surprised.) I said that Milo’s ability had two flaws, and this is the second one: can Milo (or Walternate) predict his own future? Did Milo know where his path was leading? Can Walternate see himself from the perspective of our heroes, as a threat and not a protector? Because until he realizes that Walter, Peter, et. al. see him as a threat…well, who can predict how all this will end? Milo’s motivation for starting his Rube Goldberg Death Traps was self-preservation: an offensive defense. Walternate, in turn, has some rather muddy motivations. He said to Broyles, “If we can learn what she already knows…” Broyles finished the though: “We can begin to defend ourselves.” But is that what Walternate wants? Or does he want to go on the offensive? I find it telling that he let Broyles finish the sentence for him. I find it even more telling that he considers the whole world his laboratory. Does he include himself in that assessment? One last parallel: Milo’s brain powers are beyond human understanding. Olivia’s reaction to the memory-overwriting, in turn, is rather beyond the pale: her subconscious is manifesting as Peter, and giving her directions as well as smoochies. Can Walternate have predicted that? Unlike Milo, who became completely unattached to his sister and the symbolism of the toy horse, Olivia still has her humanity, and that’s part of what’s keeping her from fauxing out. So far. The parallels here are fascinating, especially when seen in the context of the Over There/Over Here binary that haunts each of these world-specific episodes: it’s an “infinite spiral” of interlocking themes, plots, motives, and reactions. It’s hard for me to boil this down to a Theme of the Week, but it might be the instinctive defense vs. the intentional offense, and how those two are in constant conflict. • An avocado shortage, on top of the coffee shortage we learned about in Season Two? What a terrible, horrible, no good, very bad world. • I loved, loved, loved the opening sequence. It was so easy to figure out what was going on, in terms of Milo predicting events, and it was all done with camera angles and telling facial gestures. I also really liked the broken-up screen to portray his thought processes, especially when the pictures got too small to see on my TV. It reminded me of Stieg Larsson’s portrayal of Lisbeth Salander’s though processes: click, click, click. • I also really like that, Over There, Fringe Division is outfitted like a paramilitary organization. It’s a nice contrast to Olivia’s suits Over Here. • Smallpox in North Texas. I strongly recommend that everyone read Richard Preston’s book The Demon in the Freezer. Smallpox is scary. • It looks like we have the god-forsaken tank to look forward to. I hope I like it more now that Fringe is awesome. Because I really hated it every time it was used in Season One. When you mentioned Rube Goldberg Death Traps, I was immediately reminded of the X-Files episode The Goldberg Variation. It came with an intricate mouse trap. The character in it had extremely good luck, causing others around him to unfortunate ends. There was something I missed when I watched the scenes leading up to the avocadoes. 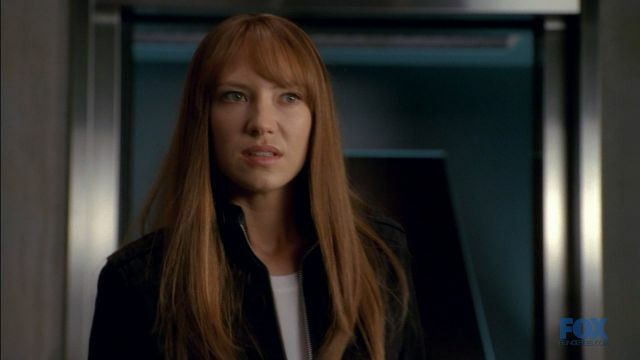 (Keep in mind what Anna Torv always said about the men on Fringe.) First time we see Frank in this episode is barefoot and in the kitchen.